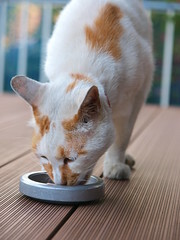 A Path With Paws » Blog Archive » How do I pick the best food for my cat’s health? « How do I pick the best food for my dog’s health? How do I pick the best food for my cat’s health? So what do I feed my cat? And how do I change their food? Anyone who has been owned by a cat knows that changing their food can be one of the hardest projects to undertake. Of course there are those cats who will eat anything but they are rare. So how do you choose what to feed your cat and how do you find something they will eat? Many of these rules you will recognize from my dog food article but cats are still cats and there are differences. Make sure meat is the first ingredient and that it is real meat. It should be chicken or turkey or some other recognizable meat or fish(not animal which can be euthanized cats and dogs- yuck!). There should be no by products which can be diseased meat, feathers, blood, pus, etc. In cats this is especially important. Cats are true carnivores meaning they will die without meat. Because of this meat should be most of their diet. They absolutely should not be on a grain heavy diet. And cats should never be on a vegetarian diet. Stay away from corn and wheat. Many animals are allergic to these and usually only low quality foods have corn. The one exception I can think of to this is that Weruva has a couple foods that have chunks of corn in them. I still think this is a high quality food. Learn how to read labels. You want to see a list of foods you recognize at the top (in cats this should be mostly meat), and then a list of vitamin and minerals you may not, closer to the bottom. Avoid dyes, preservatives like BHA, BHT, and erythoxyquin, food stabilizers like propylene glycol, and sugars and salt. For more information on how to read a label see the article What is really in pet food? from Born Free USA. 2. Here is a list of my favorite brands There are other good foods out there also but these are the ones I recommend most often. Here is a good article from Rad Cat on Transitioning to Raw Food. Rad Cat is one of the best raw foods out there. This company only focuses on cats and they make a great food! Weruva This is the only cat food that looks good enough that I would eat it! Made with whole foods and there is no question when you open the can. There fish favorites are very yummy and a good starting food to switch over the picky cats. Homestyle by Prairie, Instinct, Nature’s Variety raw foods are all made by Nature’s Variety. Prairie is their main line, Instinct is grain free and they also make a great raw line I recommend under the Nature’s Variety name. I have been happy with all their foods. Merrick makes a great line of canned and dry foods. Their foods are yummy to many cats and they have a very cute marketing campaign. Avoderm and Pinnacle are both solid good natural foods. Avoderm is marketed for animals with itchy skin and can make a difference in cats with environmental allergies. Orijen My top choice if you have to feed dry food. Orijen is a great company with a tasty, very high quality grain free food. They locally source all their ingredients and package their own food. Felidae is a good and solid food with some added cranberry for urinary health. Many cats really love it. Evanger’s makes a mackerel and gravy that many sick cats will eat when they will not eat anything else. Darwin’s Pet is a great northwest company which makes raw diets. If you live in the Seattle area they will deliver to your doorstep. They have a very good quality product and because they are a small company a lot of control on what goes into their food. Some cats seem to not tolerate their food as well as the Rad Cat because of the small pieces of bone in it. My cats would spit them out and leave them in the dish for me which made me wonder if they were getting enough calcium. 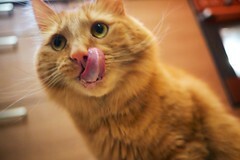 However some cats do very well on their food. The Natural Pet Pantry is located in Burien, Washington. They have a great cooked and raw product and will make to order if your cat needs a special diet. Wellness is a good solid food with good ingredients. Paw’s Cafe is another great local company in the Seattle area which makes homemade food, raw diets and custom diets. Great folks and very high quality diets. So far they only deliver to the Eastside but there is talk they may come over to Seattle soon. If they do they will be up there with Darwin’s. Update 5/20/10 Because of the recent buyout of Natura pet by Proctor and Gamble I no longer recommend Innova, Evo and California Natural and will be switching my kitties over to Orijen for dry food. I used to feed multiple brands of food to my own cats and switch flavors and brands daily. If your cat’s stomach allows it I recommend switching brands and varieties of food. This also helps if you do need to switch their food for some health reason later in life. Now I make my own raw food and switch ingredients between meat sources. If I have missed the food you feed your cat add a comment and I will give you my opinion on it. 3. Cats should not be on exclusively dry food ever and any cat over eight years of age (or a younger geriatric animal) should get no or very little dry food. Cats have a funny relationship with water. They don’t drink much of it. In fact cats on dry food only are always in a slightly dehydrated state. This can lead to kidney failure, urinary tract problems and other health issues. Dry food is cheapest and some people can not afford to feed anything but it. If dry food is all you can afford, adding a little water, chicken broth, wet food or good quality table scraps will help. There are also some animals that simply do not do well on anything but a dry food or will not eat anything but a dry food. If you feed only a dry diet make sure it is high quality and grain free. High quality dry food with water or broth is better than low quality wet food. Our cats should be on a diet with a high protein content and should be eating almost all meat. I prefer cats to be on grain free diets. However, if they are feed a food with grain, meat should be at least 2/3 of the food. Animals with allergies, cancer, or epilepsy should absolutely be on a grain free diet. Many animals with chronic vomiting also do better on a grain free diet diet. If you feed a food with grain, oats, barley, quinoa, and brown rice are ideal grain sources. Corn and wheat should not be feed to cats. Healthy animals can be on a high quality diet with a little grain or without grain but I recommend dry food be grain free in cats. Just say no to senior diets! Senior diets usually reduce the amount of protein and add more grain. Older cats do not need this! Avoid anything labeled a senior diet unless it is grain free. Weight loss diets also reduce the protein and add more bulk in grain. This is not how you get a cat to loss weight. The best way to reduce weight on your overweight cat is to feed a high protein, no grain, raw, cooked or canned food only diet! Also know as the Catkins diet. Evo and some of the other good quality foods now have weight loss, grain free diets with reduced fat, high protein and no grain. These are ok but avoid any weight loss diet with grain. In the ideal world we would all have time to come home each day and cook for ourselves and our pets. However many people don’t have time to cook for themselves or their cats. 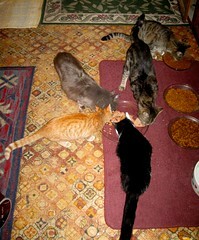 If you do have time to cook for your cats see my article Making crazy awesome homemade cat food. If you can, start your cat on a raw diet or cook for them at home. There are also companies like Paw’s Cafe and Natural Pet Pantry that make homemade cat food. If you are against feeding raw food or your cat doesn’t tolerate it, raw foods can also be cooked. Crock pots and steamers are ideal for this. Although you can always throw it in a frying pan. If you feed a raw diet make sure you use a commercial product that is frozen or if you make your own freeze it before using it to kill of any potential parasites. In cats if you make a cooked food, you must add a supplement with taurine to it. Cats will die without taurine and while they get enough on raw food there is a debate on if they get enough from cooked. To be safe always add some to homemade cooked food. Commercial foods already add it. In general the less proceeded the food the better. With raw being on the top, followed by cooked, canned and finally dry. But do what works for your household. There are almost no overweight cats on raw diets. If your cat is overweight get them off the dry food. < Any cat who has had urinary tract problems should be on a diet without dry food and the best way to prevent urinary problems is to avoid dry food. My own cats cats used to eat high quality canned food with a little dry Orijen overnight. I only added the dry after I discovered that my older cat needed a little at night or he would vomit up bile. My older cat has since passed away but I have a new girl who loves her “crunchies” so I still feed little dry in the evening along with homemade raw. While I have a number of animals on homemade or raw diets, many of my clients feed their cats a mixture of high quality dry and wet because of convenience and cost. 6. Pick the meat which is best for your cat. If possible rotate meat sources. If your animal has obvious allergies then this choice is made for you. If not, I am highly in favor of switching protein sources routinely. This reduces your animals chance of developing allergies and adds some variety to your their diet. Imagine if you had to eat the same thing over and over again. Boring! Chinese medicine also has an energetic system for working with food. See my article The dance of life and the energetics of food for more information. I do not recommend feeding pork to cats because of the way pigs are raised and the energetics that go along with that. Pork must never be eaten raw because of the diseases that pigs carry. Tuna should be limited to one can a week. For foods with just a little tuna for favor use your own judgement. Tuna is high in heavy metals and can also lead to problems with vitamin B deficiency. The exception to this is when you are working with a picky cat who doesn’t like canned food. Many times starting with the tuna flavors will help switch them over and then you can add in other canned foods. Never feed straight human tuna because without the added vitamins you end up with vitamin B and E deficiencies. No really, I know we as a veterinary community have told you they aren’t. But if you eat healthy food it is fine for your cat to have some. Just remember – no onions or chocolate. 8. For animals in kidney failure, the quality of the protein is much more important than the amount of protein. For years the veterinary community has recommended low protein for cats in kidney failure. The new studies out however show that diets moderate in very high quality protein are best for these animals. The best thing you can do for your cat in kidney failure is to keep them off the dry food. Feed high quality canned or home cooked with moderate protein. I do not recommend switching a cat with kidney failure to a raw diet if they are not already on one. Avoid the low quality, low protein prescription kidney diets. These foods are highly addictive to cats and it is very hard to get your cat off of them once they are on them. High in wheat, corn, soy, and salt and with animal by-product (euthanized cats and dogs with a little euthanasia solution in it) this is the last thing you want to feed your cat. Yuck! However many cats love these foods. The high salt and artificial flavors make them highly addictive. Stay away from these at all costs! Not only are they not good for your cat’s health but there also seems to be a higher rate of urinary tract disease in cats on these foods. 10. How do I switch over my picky cat to a new food? Cats can be hard to switch over to a new food. Sometimes nothing can seem more impossible. Here is a few things that can help. If you are switching to raw, cook it and salt it first. And then mix a little in with their normal food. Get free samples at the pet store or buy many small cans of food to try. There may be one magic flavor that does it for your cat’s pallet. If your cat likes fish and you are switching to a canned food try Weruva’s fish flavors or Evanger’s mackerel with gravy. If your cat is into poultry try Weruva’s chicken and gravy or Instinct’s chicken. If your cat will not eat canned food, add a little salt. You can take it away slowly after they are eating the wet food. If they are not sick, give them three days not to eat. Most cats will eat what you offer on the third day. If your cat is overweight absolutely do not fast them for more than three days. If overweight cats do not eat for more than three days they are at risk of a disease called hepatic lipidosis which can be deadly! Some cats get soft stools when being switched over to a new food. This should improve in a week. If it doesn’t try another food. I hope this information helps. Do the best you can with it and try to have fun! After all, you know your cat better than anyone else! Dog Aware’s dog food page More information than you could ever use about dog food!. While this is a dog site much of the information on it is also relative to cats. Born Free’s What’s Really In Pet Food A great article about pet food companies and processing. Update – Since writing this article I’ve gotten to participate in a great thread of questions about it on the West Seattle Blog. Please check out the post How to pick a good cat food where I also explain how to figure out the exact amount of food your cat needs. Also see How do I pick the best food for my dog’s health?. This entry was posted on Saturday, January 30th, 2010 at 11:05 am	and is filed under health, Uncategorized. You can follow any responses to this entry through the RSS 2.0 feed. Both comments and pings are currently closed. Thanks so much for compiling all this info in one place! As you suggested, we have definitely had to go slowly when switching to a new food–replacing just a portion and mixing it in. We tried many different healthy wet foods to find the right taste for our cats. We are now on Weruva and indeed it is like “real” food with big pieces of fish and such. Our cats won’t eat their chicken flavors though. We now have just transitioned Cooper–our overweight and super greedy eater–to a fully wet food diet in hopes it will allow him to lose some weight. It seems to already be making him have fewer “cravings” (read, meowing freakouts for food) between meals. Yay! By they way, Mud Bay Granary pet store will take back unopened cans if your cat stops liking certain flavors (as long as you return them within a month or so). They have been so great with advice and service during our transitioning of both food and litter. I love Mud Bay! I forgot to add– since we’ve been feeding our cats healthy foods for years now, I’m so impressed with how healthy their fur coats are. When I was growing up, my family fed its cats icky grocery store brands, and their fur coats were always rough feeling. Now, our cats have the silkiest, nicest fur which I believe is a reflection of their relatively healthier insides! The best brand is of course home made, but that can be pretty time consuming but worthwhile when you end up with a huge, healthy moggy! good morning, is it ok to mix plain yogurt with dry food for dogs and cats?It seems to help the animals eat more food; they aren’t crazy about dry, but i’m out of work, and cant afford canned food. Yes, yogurt is great to mix in with food and provides a good source of probiotics. Some cats and dogs are very lactose sensitive so in the rare animal it can cause diarrhea or if used in large quantities. If that occurs then you will not be able to use it but it is rare I find one of those. As far as adding moisture in older dogs a little water or broth will also help. I love your article. I do have a question though. We have a 4 year old cat as well as a new 12 week old kitten. The 4 year old cat has been on dry cat food since we got him (he was 1), thought the wet food was only a treat. Now I know different 🙂 Anyway, they constantly try to get into each others food. Is there a food that is suitable for the both of them? We can’t get them to stop sharing. Any help would be appreciated. Because all the foods recommended above are higher protein they are fine to feed your kitten as well as your cat. Kitten food is generally higher protein than cat food. In my opinion all cats should be on high protein, low grain food i.e. kitten food. 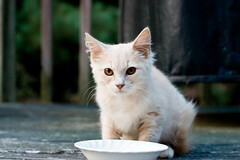 Many of the good quality foods do not even have a “kitten food” anymore because there normal food is suited for either. I wanted to thank you for your information on cat foods. I was at my wits end and had succumbed to feeding my cat Fancy Feast as he would not eat anything else in conjunction with the fact that he has Inflammatory Bowel Disease. So I was just needing him to eat. Upon finding your blog and trying the Weruva he has really made leaps and bounds in the eating realm. He still is quite picky and I must rotate his choices from time to time and it is expensive, but soooo worth it. I am recommending to friends too while explaining the importance of the grain-free (ness) of Weruva. So I still have a very skinny cat, he is a happy and getting healthier kitty. I had also struggled with my cat marking all over my home for the last year while trying to find out what was wrong with him. My vet introduced me to a pheromone collar (its like a flea collar) that immediately had him stop marking. I had tried all the other items on the market, felaway, washing everything constantly, etc. etc.- this collar made the difference. Knowledge (the right knowledge) is powerful. I am so glad your kitty is doing better! Thanks for the comment, I’m happy that the article was helpful. My kitty was diagnosed with IBD and lost a good 2lbs. She is at 7lbs. She was eating Weruva with gusto then got picky and tried my patientence for 2 months on any food at all. I now have her on Nature’s Variety Raw, and am trying her on the lamb, seeing if she may have developed allergies to chicken (no scratching or itching at all only runny stools.) My questions is what other proteins are good for kitties. I hear beef tends to be allergic to kitties and their rabbit formula is quite a bit more expensive. Is venison or bison acceptable??? too bad they don’t make mouse flavored!!! I am fine with using venison and bison in cats. I have also used beef but there are definitely some cats who are allergic to it. It does make you wonder why they haven’t marketed a mouse food for cats. I did see that they now sell treats that are made of 100% mouse but not a daily food:-) Maybe someday. If you are in the area that has holistic vet practitioners you might want to see if you can find a good vet acupuncturist and herbalist. I have had a lot of success with treating IBD. Check out http://www.ivas.org to see if they have someone in your area or ask at the local holistic pet store (if there is one). Since I have never made homemade food for my cats before, I would like to ask a bit out that. So if we cook the meat, would you recommend further additions to the pot? Any special recipe you would like to share? One of the books recommended on the subject is $90.00 on amazon! What are your best suggestions for someone on a very limited budget, with 7 cats, (all foundlings or rescues!)? I am hoping I can get my husband involved as he is a hunter, and therefore we have duck, goose, rabbit and deer as an option also:) Thank you for your time. There are many books out there but generally if you are doing home cooking for your cat you can follow the following guidelines. 20% veggies – this can also include squash, pumpkin or sweet potato. Usually you need to grind or chop these quite small. To both of these diets if you are cooking I would add at least 250mg taurine per cat, a source of calcium and cod liver oil (contains omegas and vit A and D). You can also use a pre-made vit supplement for cats, there are many out there. I have folks add a vit supplement to this. If you are feeding the meat raw you don’t need the taurine and you can use ground bone as a calcium source. But if you feed it raw it needs to be frozen first to kill any parasites. Don’t feed pork raw. Anitra Frazier’s The New Natural Cat is a great book for diets although some are a little heavier on grain then I would recommend. I bet you can get an used copy cheap on Amazon. Thank you very much, Lena:) Those recipes are very doable and I appreciate learning about the percentages. I know the dry food I feed now, with the tablespoon of wet canned, is not doing my kitties health any favors. I guess I was just at a loss on where to begin a change over. Thank you for your post about this issue and further explaining with recipes and tips! I will check out that book for sure. i have been reading your article and have found it very informative – thank you! I have a couple of questions, maybe you can help. I have 3 indoor cats who are around 10 years old, 2 female and 1 male. theyre all neutered and the male is a little overweight. 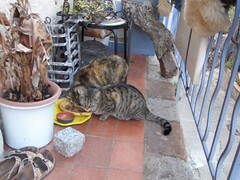 my vet in spain had him (and the girls by extension) eating Hills r/d prescription diet dry food and a bit of canned food every day. we have recently moved to the nyc and, since there are so many more choices here and also, my vet is not here to prescribe the r/d, we decided to try other brands. we have been feeding them wellness healthy weight for about a month now and, although theyre not crazy about the flavor, theyre eating it ok. however, it seems like their stool is still soft and im wondering if something in the food can be hurting their stomach or if its just the fact that theyre eating more veggies, so to speak. also, ive read a lot about orijen but im wondering if it will be a little drastic for them, or if it will result in them eating more and thus gaining weight, the male, in particular. i have yet to find a vet in the neighborhood, but i was hoping you could answer some of my questions in the meantime – thank you very much! All good questions. I’m not a fan of r/d because it is very high in grain, especially corn and the meat sources are by-product. I think long term it can cause a lot of health issues. I’m glad you are moving them off of it. If you have been feeding them Wellness for about a month and they are still having loose stools it may not be the right food for them. I don’t think it is the more veggies as much as just that it may not click with their systems. I really like the Orijen if you are feeding a dry food and I don’t think it would be too large a leap to make. I prefer to feed cats wet, raw or partially wet or raw food if possible but if you are feeding dry Orijen is definitely the way to go. I have found that cats that are on high protein diets (like Orijen) usually have less issues with weight gain then cats on diets high in grain. You still will usually have to avoid free feeding but that is true of any food. However the best way to keep cats trim is to do a canned grain free or raw diet. I have to admit even though my own four kitties are on 90% raw and a little canned Weruva and Instinct, one of my cats loves Orijen dry. I give her a very small amount of it every night just because she loves it so much. Hi! We adopted an 8-year-old cat two months ago who suffers from chronic urinary tract infections (she has not had an infection since October 2010). At the shelter, they had her on Hills c/d, but I would prefer to have her on a food with higher quality ingredients. When we brought her home, we tried to transition her to Weruva, and she really liked most of the varieties they offer, but they gave her loose stools which never went away. We took her off of the Weruva after four weeks and gave her boiled chicken and canned pumpkin for a few days, which took care of the problem right away. I tried several times to give her raw food because that is what I feed my dog, but she refused to eat it (even when mixed with the canned food). We then tried to slowly put her back on the Weruva (using only one of the chicken formulas this time), but the loose stools returned almost immediately. Now we are trying canned Wellness and Nature’s Variety Instinct, and she has not had any digestive issues with either. However, I am not sure if these are the best foods for her health issues (to me, it seems like Weruva is unfortunately the best canned option for urinary tract health). I stumbled onto your site while trying to find a solution to this dilemma, and I was hoping you might have some suggestions. Aside from the raw, she is (thankfully!) not a picky eater. Thanks so much! This article has already been most helpful! Do you know if it was bacterial infections or feline lower urinary tract disease? They are a little different yet cats with FLUTD (which is an inflammatory condition but not bacterial) often gets referred to as having chronic urinary tract infections. If it was true urinary tract infections you are already on a good plan by not feeding her dry. I see Instinct as being as good as Weruva so if she will eat that I think you are good. Wellness is ok, a little less quality then Weruva or Instinct. I like the Instinct since with its high protein it will help keep the urine acidified which will prevent UTIs. I have also had my cilents add cranberry extract to the food in cats with chronic urinary issues. Cats generally will tolerate about 250mg a day mixed in with their food from an open capsule. If you want to try the raw again sometimes cats will eat it cooked and then you can pull away the amount it is cooked very slowly until it is raw. But if she absolutely will not eat it, no worries. The Instinct is fine. Some cats who can’t tolerate raw (digestion wise) will not eat it. Sometimes if they have been used to very processed food then it is just too much of a jump. That may also be why she is not tolerating the Weruva well now. It’s great that you adopted an older cat with some issues. It is sometimes so hard to find the older ones homes. Thank you! Thanks for your help! Honestly, I’m not really sure which condition she has. I do know that she always has blood in her urine, even if there is not an infection, and they also said that she will have bacteria if there is a UTI. She also gets crystals in her urine and has had issues with bladder inflammation in the past. Maybe that information can tell you what it is? Lucky for me, she prefers the Instinct to the Wellness, so I think I will encourage that. She was at the shelter for three years before we adopted her, so I know she has been on c/d for that long…and I’m guessing that since the people who had her prior to that just let her wander the street and didn’t even want her back when she was picked up by animal control, she probably hasn’t been eating the best food. What I’m hoping is that we can get her tummy settled and get her into a routine, and if she continues to not have digestive or urinary tract issues, then I might try to give her Weruva or raw again. Maybe since the Instinct is similar to Nature’s Variety’s raw formulas, she will be more receptive. You have no idea how helpful this was! I absolutely love your site. I worked at an acupuncture clinic for several years, and I work with the vet acupuncturist in my town when I can afford it. Chinese medicine never ceases to amaze me, and this is an invaluable resource. Sounds like she does have FLUTD as well as sometimes getting UTIs. FLUTD seems to have a stress component to it so as she settles in hopefully it will get better in addition to the steady diet of good wet food. If she is still having a lot of inflammation in her bladder a simple thing to try would be Animal Apawthecary’s Tinkle Tonic. I’ve used it in a lot of FLUTD cats to reduce inflammation. I’ve also worked with Chinese herbs for some of these cats but that gets a lot more specific and would be something you would want to see your vet acupuncturist for (if they are skilled in herbs). Hi Lena! I have 5 male kitties one 4yr old with FS that my vet said that pulling his teeth is not a complete cure & he is so far into the disease, gums bleed but his teeth are beautiful, mouth pain & he also sneezes alot & sometimes its bloody. I got him from a shelter I volunteered at & no one would take him because he was always sickly. He is a great kitty. He’s been on Depo Medrol shots & Convenia shots & now prednisone tablets & clindamycin tablets. I have been reading that this is not really helping him. I just put my 3yr old female down because the disease had gone to her kidneys & she wasn’t responding to treatment. I DO NOT want to lose this one too! I did recently switch their diets to Natural Balance Limited Ingredient Diets with no grain or gluten & my 12yr old has Inflammatory Bowel disease & he is doing better. I feed them the canned every other night. Should I increase the canned? The store I shop has most of the brands you talk about & I see they get bored with the same dry food. Any thoughts would be appreciated with food & my FS kitty. Thanks so much for sharing all your knowledge! Feline Stomatitis is a very hard disease. I have two stomatitis cats, one rostral and one caudal. My rostral stomatitis cat, Melody, had all her teeth pulled ten years ago and has been perfect since. Rostral stomatitis is curative with teeth removal. Raven, my caudal stomatitis 3 year old just went through having his molars and premolars pulled and his periodontal ligaments removed. He was in quite a bit of pain and now is running around the house like a kitten again. I am so happy. BTW stomatitis should not go to the kidneys – possibly something else going on secondary to the depo which is hard on the kidneys (pred is also). Here is an article I wrote about stomatitis if you haven’t found it already – link below. Grain free canned is great. Even better if you can do it and they will eat it is a homemade highly inflammatory diet – recipe link below. This is an inflammatory disease. I wish I could have told you earlier to not do the steroids and just get rid of the teeth and ligaments. My cats were both very sickly small kittens with poor starts to life which unfortunately makes this disease more likely. Forgot to answer- yes if you can have them on all canned, homemade or raw that is the best. No dry for this disease. I’ve got three female rescues, 2 of which are relatively “normal” sized and one who is definitely overweight. I’m concerned about her because it seems like she’s having a harder time getting around these days, and I’m sure much of it has to do with the extra weight she’s carrying. Back when I didn’t know any better, I had all of them on a hard food only diet. I’ve learned from my mistakes and now they get a mix of hard and soft. However, I know I’m still not doing them any favors because they’re getting mostly icky supermarket stuff. I’ve tried some of the better brands on and off, but the choices are so overwhelming, I am never sure if I’m picking the right ones. Thank you so much for your summary above. It’s a huge help! It seems like several people have good remarks for Weruva, so I was going to try that out for my girls. However, I’m finding that there’s Weruva, and Weruva B.F.F. Is there a difference? My next concern/question is how to keep the overweight cat from bullying the other cats out of their food. She does it all the time! She’ll gobble hers down and then go for the other bowls. I try my best to keep her away, but I can’t always be standing there to police the food. I don’t know if it’s because she’s still hungry or if she’s just addicted to the “fast food” junk I’m giving her. I don’t know if I’m giving her too much or too little. I’m really desperate to help her get her weight under control because I know it’s just going to shorten her life if I don’t. I actually wasn’t aware the BFF was made by Weruva. BFF is very high in tuna and while I think it is ok to mix when switching foods or trying to get them off addictive grocery store food I wouldn’t recommend it as a daily diet. I have found that raw is the ultimate to help cats loss weight without the thin ones losing it also but high protein canned can also help a lot. I have also found that feeding twice a day and then picking up the food can help get the other two to eat faster (you may have to lock up the overweight one for a little while or police the bowls if she eats super fast). It takes some time for them to get used to the new system. Thanks for the feedback! Right now, raw might be a little cost prohibitive for me. Of the above brands you mentioned, would there be one or two with high protein levels that you would suggest I zero in on? Thanks again for all of this great information. You introduced me to a lot of new brands. Instinct and Weruva (the lower grain varieties) are my favorite for the kitties. Often raw is cheaper than canned, at least in my area, so you may want to price it. Also Amazon.com often has Weruva a lot cheaper than in the stores. Hi Lena! I would really appreciate your advice on my kitty. She’s a tabby, will be turning 7 in the spring. Since spring of this year, I have noticed her regurgitating her food more often, about 3 times a week! the food was not digested. I called the vet and told him what was happening. He and I weren’t too concerned because she was not acting weird and everything was the same except for me coming home finding a small pile of food on the floor..yuk! anyhow, he told me to switch her over to Hills I/D for sensitive stomachs. I did for a couple of months but noticed that she was still throwing up more than usual. So then I did some research on my own and switched her over to ACANA, grain free. She has been on it for 2 1/2 months now and threw up 3 times which is a lot less than she used too. I’m wondering..should i switch her over to canned food? or perhaps do half canned/half dry? Also, not sure if Acana and Orjen are the same, do you feel that Orjen is better? I love my cat and want to feed her the best possible food possible! I do occasionally give her some olive oil and she loves it 🙂 She has always maintained a slim figure, however i think she might of gained a tad bit of weight from ACANA or its just her winter fur that’s deceiving me! I would recommend trying her on some canned food – I really think cats do better on non-dry food. Some is better than none so if it doesn’t work to feed her all canned then do a mix. Go slowly and see how she does. Acana and Orijen are made by the same folks and are both good foods. I like the Orijen better because it is higher in protein and animal ingredients (80% vs 65%). Acana has more potato in it but is a little cheaper because of it. I find cats do best on high animal protein diets. Usually cats on all wet have less weight issues and cats on raw have almost no weight issues so if she is really getting plump and it isn’t just fur the switch may also help her lose a little weight. Thank you so much Lena for your quick reply! How would i do this? I leave her dry food out all day, i’ve always done it as she eats when she wants too and never had any weight issues. I will switch over to Orijen. Should i mix the canned with the dry and feed her once in the morning and then once in the evening? or give her a bit of wet in the morning and just leave the dry food out? she also eats a bit before she goes to bed and at night time a bit as well. I think it is better for most cats to eat twice a day however that takes a little bit of adjusting. You can start by giving her a little wet twice a day and leaving the dry where it is. If she will not eat the wet then you might have to take the dry away so she does or mix it with dry and feed it twice a day. There will probably be some complaining at first if she is used to being free feed but most cats adjust fairly quickly (about a week) to going from free feed to twice a day feeding. In my opinion most pancreatitis in cats is from the carbs and amount of processing and yes even grain frees that are high in starches such as potato can contribute, esp if dry. I have never seen a cat on raw with pancreatitis. Less processed = less inflammation = decreased risk of pancreatitis.I am still surprised that with a combo of raw and wellness he would have a bout of it, unless the Wellness was dry and then that could be enough to cause it. Was there anything else around that time that could have contributed? Flea meds? Vaccines? I dislike Hill’s and I/D and have found that most cats do well for awhile and then develop digestive issues again from the high carbs (and in my opinion more proceeded is worse, than less proceeded). High processed causes inflammation in the body and can lead back to pancreatitis. It is hard to get cats off carb foods. I advise to add in a little at a time slowly and stick with either canned (low starch/grain), homemade, or raw. Instinct is a good canned if you are looking for one higher in protein but raw or homemade is probably best. Hello Lena I was wondering if you could answer a few questions for me? What is the safest and healthiest wet and dry food in your opinion that is not expensive? Is it true that I can just add water to my cats dry food to make it more moist to try to prevent UTI? Both of my cats seem pretty healthy I just want to learn more thanks! There are many ideas about what is not expensive so I am not sure how to answer that. I would price some of the foods in this article. If you have time but not as much money making homemade food may also be a good option, esp if you can find a source of cheaper chicken. I like to feed cats twice a day. Dry food watered down is not equal to wet/homemade/raw food but it is much better than just dry food alone because it takes care of the dehyration problem. There are many things involved in preventing UTI – less proceeded food helps – which you don’t get from just watering the food down, however dehyration also contributes to urinary problems so the water will help. Most likely if your cat is vomiting after eating there is some inflammation in his GI tract. Usually cats who vomit will do better on less proceeded food and grain free. If you haven’t taken him to a vet and it is a new behavior I would consider ruling out any serious issues.